At the D:Dive Into Mobile event where Andy Rubin showed off an unannounced Motorola Android Honeycomb tablet, Google Maps for Mobile 5 was previewed, which features many improvements, and should be available on many Android handsets in the next few days. The new version of Google Maps features 3D views and dynamic map drawing, which relys on "vectors instead of flat images that scale without render hiccups and will show the buildings fleshed out for over 100 cities" according to Engadget. The update also comes with the ability to use two fingers to rotate and tilt, as well as the rotate and pinch-to-zoom that is already supported. Speed has also been improved, and offline caching of some map areas will also be supported for regular use as well as some navigational use. Curiously, the Nexus One is not listed as one of those devices that will completely support the update. Apparently, the multi-touch capability of the Nexus One is not up to par to support the rotate feature. Other recent Android phones that are not listed should hopefully be able to support many, if not most of the new features. Google Maps is - next to Flash - the largest app that cannot be transferred to SD card (no App2SD) and therefor a pain on Desire and other phones. Since Google Earth can be transferred, I don't see why Google Maps cannot. I'm not sure why it hasn't been added yet, but I believe that it since it hasn't been mentioned, Google Maps is still required to be installed on the internal storage. 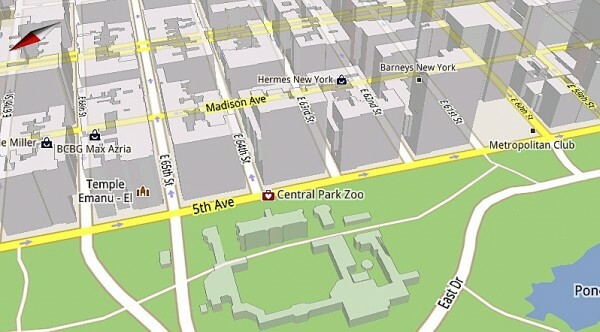 I hope the new vesion of Google Maps will be transferable to the SD card - or is there a reason why it cannot be?